The No. 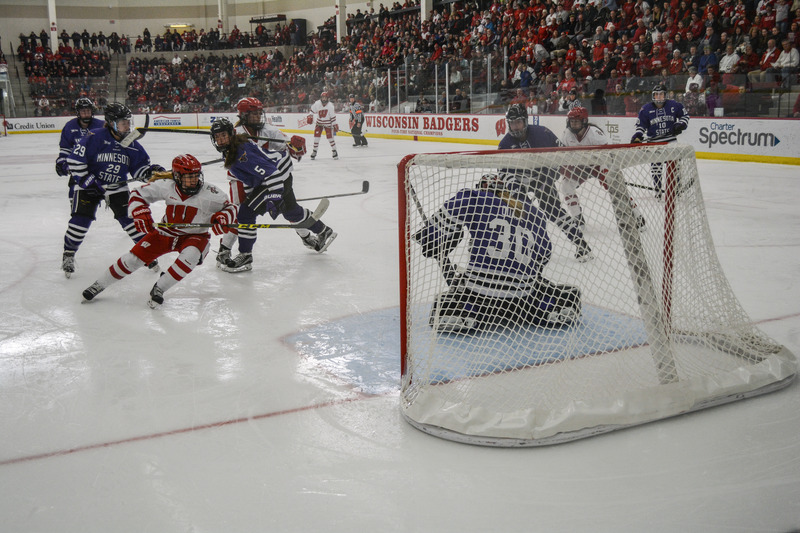 1 University of Wisconsin women’s hockey team suffered a hard, 2-0 loss to rival, No. 2 University of Minnesota – Twin Cities on Saturday night in Madison. Despite the tough defeat, the Badgers gave their home crowd something to cheer for Sunday as they rebounded and dismantled the Gophers, 8-2. Saturday’s contest between the No. 1 ranked team and the No. 2 ranked team showed the equality between both teams. The Badgers (15-2-1-0, 11-2-1-0 WCHA) tried to catch the Gophers (14-2-2, 12-2-2 WCHA) off guard at first, showing speed and stamina in one of the longest games that the Badgers have played thus far this season. But a second period goal from Minnesota’s Kate Schipper would shake up the Badgers, especially goaltender Ann-Renée Desbiens, who had been playing more hesitantly than usual. Desbiens, who had been out for the previous two weeks due to concussion-like symptoms, seemed to be more cautious of herself and her abilities. This goal would send the Badgers into a bit of a frenzy, and UW tried their best to stump Gopher goaltender Sidney Peters, who was having a phenomenal night. Unfortunately, it did not seem as if luck was on the side of the Wisconsin players as all shots on goal were either blocked by the goaltender or deflected. Wisconsin would go on to lose Saturday night, posting a 2-0 final score gleaming off the score board. With only two goals being scored the entire game, one of them being an empty-net goal, it was clear that the Badgers were doing some key things right but just needed to get pucks into the net. 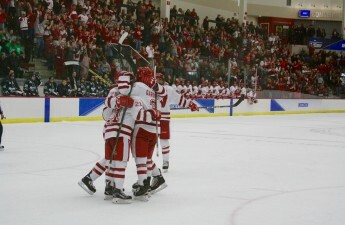 As the Badgers skated off Saturday, it seemed as if luck was not on their side. Sunday, however, would be a new day, and it seemed that the luck turned in favor of the home team. Given Saturday’s slow start, it was surprising that the Badgers managed to acquire four goals within the first period Sunday. It seemed as if Peters was off her game, and with Desbiens back into her usual groove, the balance now dramatically shifted in favor of Wisconsin. Once again, we saw the Badgers emerge thanks to two dominant players. Sarah Nurse, who would garner up her second hat trick of the season, led the scoring drive for Wisconsin. Right behind Nurse was Baylee Wellhausen, who tallied two of Wisconsin’s eight goals of the afternoon. On the other end of the ice, Desbiens silenced any naysayers, stopping 23 shots from entering her net and only allowing two goals that game. With an 8-2 win, the Badgers and Gophers walked away from this weekend at a stalemate, and won’t be able to figure out which team is the better until February. Wisconsin head coach Mark Johnson was proud of how his team’s players handled themselves this weekend, especially his once-injured netminder. The Badgers remain in action this week as they travel to Columbus, Ohio to take on the Ohio State University Buckeyes next weekend. With two losses now on the books, Wisconsin will look to begin another win streak to prepare for the next Minnesota series in two months.